Pneumatically adjusts 8" up or down while seated. Independent paddle levers control 22° back angle and 10° seat tilt adjustment. Back adjusts 5" in height. Foam seat won't crack or peel. Safco TaskMaster 5113 Deluxe Workbench Chair - Industrial chair offers contoured seat and back with lumbar support, 2-1/2" seat cushion depth, a 20" diameter footring and a 26" reinforced nylon five-prong base with 2" glides. Adjusts 19" to 27". Independent paddle levers control 22 degree back angle and 10 degree seat tilt adjustment. Back adjusts 5" up and down. Seat measures 18-1/2" wide x 17" deep. Back measures 15-3/4" wide x 12" high. 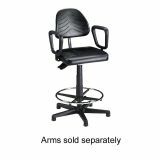 Functions include pneumatic seat-height adjustment, back height adjustment and 360-degree swivel. Industrial chair holds 250 lb. Large reinforced base ensures stability.